If no values are specified in this dialog Data Splitter will run once, when the user issues the run command. If an interval is specified Data Splitter will be run multiple times, the interval specifying the number of seconds between run starts. If a start time is specified Data Splitter will run then. 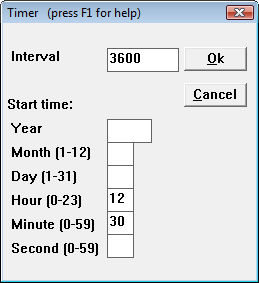 The interval and start time can both be specified. In that case the first run will occur at the start time, subsequent runs starting every "interval" seconds thereafter. The start time must be in the future. If it is past an error dialog will appear when the run command is issued. If Data Splitter is still running when the interval ends the next start will occur at the end of the next interval when Data Splitter is idle. In other words, interval "spacing" is preserved. Command line program DS.exe can be used to run Data Splitter as a Windows Scheduled Task. Scheduled Tasks provide additional features to control when programs run. Consult Windows documentation and the DS command line program topic for more information.